Brethren, we helping do exhort you, that you receive not the grace of God in vain. For he saith: In an accepted time have I heard thee; and in the day of salvation have I helped thee. Behold, now is the acceptable time; behold, now is the day of salvation. Giving no offence to any man, that our ministry be not blamed: But in all things let us exhibit ourselves as the ministers of God, in much patience, in tribulation, in necessities, in distresses, In stripes, in prisons, in seditions, in labours, in watchings, in fastings, in chastity, in knowledge, in longsuffering, in sweetness, in the Holy Ghost, in charity unfeigned, in the word of truth, in the power of God; by the armour of justice on the right hand and on the left; By honour and dishonour, by evil report and good report; as deceivers, and yet true; as unknown, and yet known; as dying, and behold we live; as chastised, and not killed; as sorrowful, yet always rejoicing; as needy, yet enriching many; as having nothing, and possessing all things. God hath given His Angels charge over thee, to keep the in all thy ways. In their hands they shall bear thee up, lest thou dash thy foot against a stone. He that dwelleth in the aid of the most High, shall abide under the protection of the God of Jacob. He shall say to the Lord: Thou art my protector, and my refuge: my God, in him will I trust. For he hath delivered me from the snare of the hunters: and from the sharp word. He will overshadow thee with his shoulders: and under his wings thou shalt trust. His truth shall compass thee with a shield: thou shalt not be afraid of the terror of the night. Of the arrow that flieth in the day, of the business that walketh about in the dark: of invasion, or of the noonday devil. A thousand shall fall at thy side, and ten thousand at thy right hand: but it shall not come nigh thee. For he hath given his angels charge over thee; to keep thee in all thy ways. In their hands they shall bear thee up: lest thou dash thy foot against a stone. 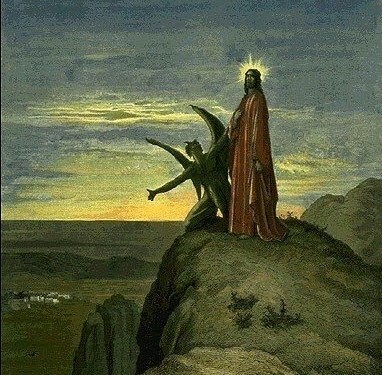 Thou shalt walk upon the asp and the basilisk: and thou shalt trample under foot the lion and the dragon. Because he hoped in me I will deliver him: I will protect him because he hath known my name. He shall cry to me, and I will hear him: I am with him in tribulation, I will deliver him, and I will glorify him. I will fill him with length of days; and I will show him my salvation. The Lord will overshadow thee with His shoulders, and under His wings thou shalt trust: His truth shall compass thee with a shield. He will overshadow thee with his shoulders: and under his wings thou shalt trust. His truth shall compass thee with a shield: thou shalt not be afraid of the terror of the night. Concede, misericors Deus, fragilitati nostrae praesidium; ut qui sanctae Dei Genitricis memoriam agimus, intercessionis ejus auxilio a nostris iniquitatibus resurgamus. Per eumdem Christum Dominum nostrum. To warn us that no man, however holy he be, should think himself safe and free from temptation. Whence again His choosing to be tempted after His baptism, about which St. Hilary says, “The devil’s wiles are especially directed to trap us at times when we have recently been made holy, because the devil desires no victory so much as a victory over the world of grace.” Whence too, the scripture warns us, Son, when thou comest to the service of God, stand in justice and in fear, and prepare thy soul for temptation (Ecclus. ii. i). To fill and saturate our minds with confidence in His mercy. For we have not a high-priest who cannot have compassion on our infirmities, but one tempted in all things, like as we are, without sin (Heb. iv. 15). As we embark on this Holy Season of Lent, let us all remember in our prayers those who are suffering or who have died as a result of terrorist atrocities throughout the world; especially those who are suffering, both Christian and Muslim, in Syria and Iraq at the hands of the D’aesh terrorists and their murderous mediæval ideology. Let us also pray that through our Lenten observance we may be drawn ever closer to God, His Blessed Mother and all His Holy Saints.